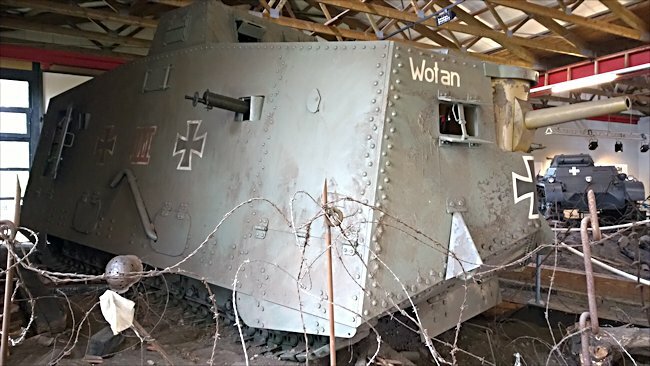 This WW1 German Sturmpanzerwagen A7V tank replica has been used in TV and Films. They now have homes in different Tank Museums. 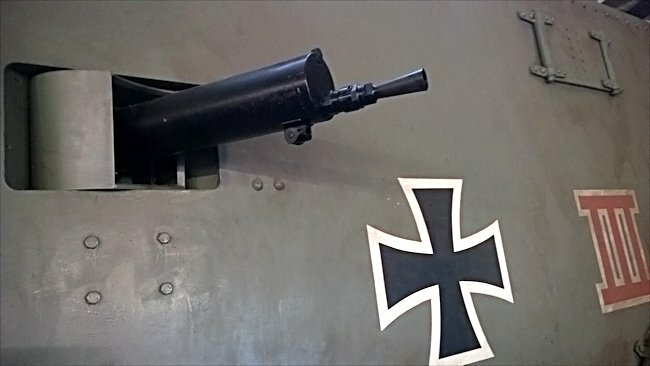 WW1 German Sturmpanzerwagen A7V tank replica at the German Tank Museum, Munster with its 5.7 cm Maxim-Nordenfelt cannon sticking out the front. The German answer to use of tanks on the World War I battlefield was first to use captured British Mark IV tanks gets their previous owners whilst they developed their own armoured weapon. The first German tank was to be called the Sturmpanzerwagen A7V. It was a real monster requiring a crew of 18 to maintain the two Daimler-Benz engines, drive the vehicle and operate its main cannon and machine guns. It was a large armoured box fitted onto agricultural tracks that have a high centre of gravity. It had an alarming defect in that if the ground was too uneven, they had a tendency to fall over. It was a rather hastily conceived answer to the British armoured threat. It was a good example of something designed by committee. A7V tank replica at the Deutsches Panzermuseum Munster, Germany with a Spanish Civil War and early WW2 Panzer I in the background. Contrary to popular belief, only 20 Sturmpanzerwagen A7V German tanks were built during the First World War. Rather than rely on this new technical development, German High Command put their aspirations of victory into new artillery tactics and the use of storm troopers. It had a 57mm Maxim-Nordenfelt main gun that protruded from the front of the vehicle. The A7V tank could carry 500 rounds of ammunition. It also had six 7.9mm MG08 machine guns. It had 30mm of armour at the front with only 15mm of protective armour of side and 20mm of armour rear plates. The area tanks of World War I needed to most armour protection was on the roof. More tanks were destroyed by high explosive artillery shells than by direct fire. The A7V German tank only had 10mm of armour plating on its roof. The Sturmpanzerwagen A7V tank was armed with six 7.92 mm MG08 machine guns. This gun was at the front on the left side. It was a heavy machine weighing in at 33 tonnes. It could only travel 4mph cross-country and 9 mph of roads. In 1918 this combination appear to be working as in the spring offensive they pushed Allied positions back some 40 miles in certain locations. By the summer of 1918, the Germans had lost over 800,000 men. Troops in this offensive were exhausted. They couldn't cope with the massed attack of 430 British tanks that followed on 8 August 1980. This was to be the German army's blackest day. The Allied victory was not easy. The cost similar machines was very high. Only 155 British tanks were available for action the next day. Many were knocked out by artillery fire. Large majority were put out of action by mechanical defects. Tank crews had to quickly abandoned the vehicle as it became an easy target for the German big guns. By the fourth day only 38 British tanks were available for action stop. When the war ended the defeated German Generals needed something to blame. They chose the deployment of British tanks as the reason they lost the war. In their eagerness to cover up their own incompetence they exaggerated the extent of the tanks abilities and military success. The tank played an important part in winning the war but it was not the weapon won the war. The image of the tank was very successfully used as a propaganda icon. Ironically this had a major effect on the German army leading up to World War II. WW1 German Sturmpanzerwagen A7V tank replica at the Tank Museum, Bovington. It is in working condition and comes out to play on TankFest open days. 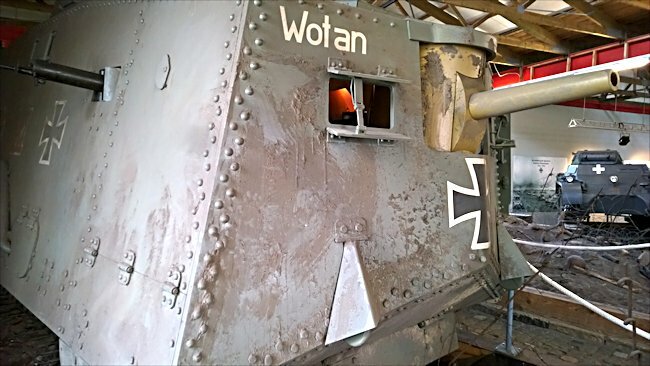 The two A7V german tanks at the German Tank Museum in Munster and Bovington Tank Museum in England are both replicas. 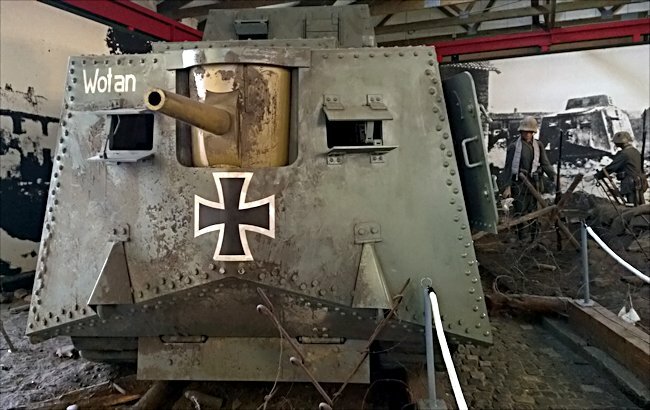 The only surviving original A7V tank is the Mephisto, tank number 506. All the other 19 tanks were either destroyed on the battlefield or scrapped for the value of their metal. The AV7 tank called Mephisto fell into a large shell hole in April 1918 and could not get out under its own power. The Germans could not recover it safely so it was abandoned. The front line moved eastwards in June and July which made it accessible to Allied troops. It was recovered by two vehicles from the 2nd gun carrier squadron (not known whether these were gun carriers or Mark IV Supply tanks). The troops of the 26th Battalion of the 7th Brigade of the Australian Army supplied the labour force to recover the A7V. The British had two other A7Vs and were not adverse to the Australians returning the A7V number 506 to Australia. They hoisted it onto their troop ship and took it home with them to Brisbane. Although there were only 20 A7Vs built there were 100 A7V chassis built - many of them were completed as Uberlandwagens but weren't used much because they used too much fuel and the payloads got shaken around too much. 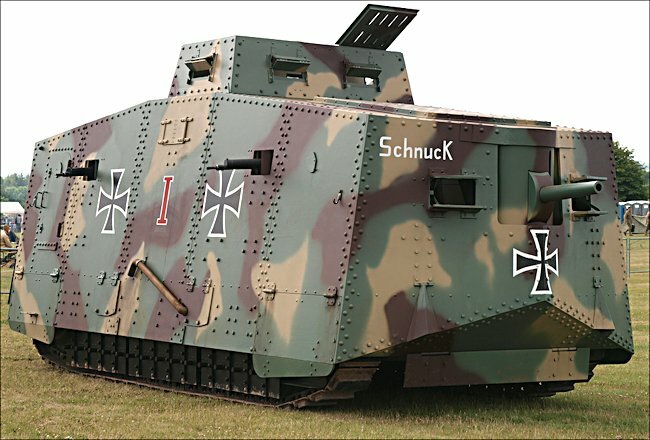 Some of the other A7V chassis were developed as anti-aircraft vehicles and crowd control tanks (with the Freicorps).